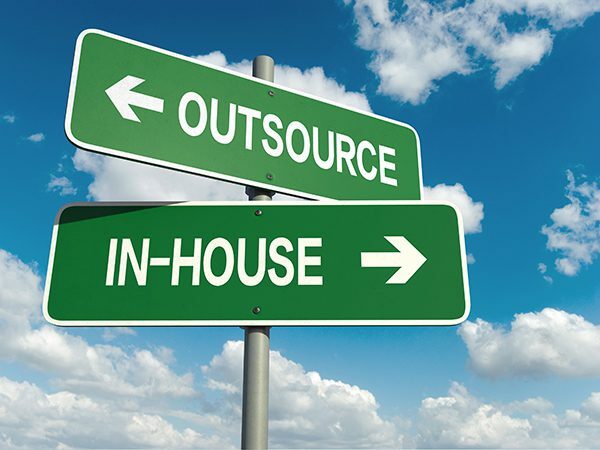 In-house marketing or outsource to an agency – what’s better for you? Effective digital marketing is absolutely vital for any business – allowing you to reach out to new customers and reinforce your brand image and reputation amongst existing ones. But a big question for many companies is whether to handle their marketing in-house or to outsource the role to an agency. There are a number of pros and cons to consider for both sides of the argument, and it’s important that you carefully consider all options before making a decision. On the one hand, in-house training is an investment for the future. However, it does require the investment of both time and funds in order to be successful. On the other hand, outsourced marketing allows you to access a team of skilled, experienced, and dedicated professionals as and when you need them. However, this approach can limit the development of your staff in terms of marketing experience. It’s a debate that’s gone on for as long as we can remember. Ultimately, however, the decision will come down to which approach works best for your business. An in-house marketing team allows you to have more control over timescales, which typically means that ideas are generated and work is completed faster. Being in constant contact with your marketing team will also allow you to track goals and progress, and review your strategy more efficiently. One of the key benefits of an in-house marker is that they have daily access to and contact with all departments in your organisation, allowing them to become an expert in your product. This means that your marketers can learn about your organisation’s history and current roadmap, so they can build a long-term marketing strategy in line with your vision for the company. They can also learn about the finer details of how the product works directly from the development team, which means that they can market it in a concrete and effective way. An in-house marketing team can communicate and align at any time because every team member is just a shoulder tap away. Daily interactions such as weekly meetings and regular catch-ups can help to reinforce the underpinnings of your marketing strategy. If you hire an in-house team, you will have to be prepared to pay a competitive wage to each member of the team. Although this could well be a price worth paying if you need someone on a full time basis, you could retain the services of an agency for far less and you won’t have to worry about sick pay or holidays. If you want to keep your in-house marketing team up to date, you’ll need to be prepared to invest time and training – identifying the training needed to keep your business one step ahead, and then paying for the training itself. Let’s take SEO, for example, staying on top of SEO and securing a desirable Google Search result isn’t as simple as it might appear and you’ll need to stay up to date with the latest tools and techniques if you want to stay ahead of the curve and your competitors. Following on from training, staff retention can also pose a problem to in-house teams. Although building the skills of your in-house team is an investment for your business, if more skilled and experienced staff start leaving for better paid positions, you’ll need to invest in staff and training once again. Whether it’s due to time, budget, or lack of skills, your in-house team will have a limit on how much they can handle in terms of workload. If you decide to ramp up your marketing efforts at any point, it might mean taking on extra staff, or having to set much longer deadlines, which will limit your productivity in the long run. Outsourcing your marketing activities to an external agency can be extremely cost effective, typically costing you just a fraction of what it would cost to hire a full-time marketing member of staff. It also means that you won’t lose out on vital marketing time for holidays or sick leave, as there’ll always be a member of agency staff on hand ready to take over and ensure your campaign continues to run smoothly. When you outsource your marketing requirements to an external agency, you’ll have access to a huge range of skills and expertise – from web designers, copywriters, advertising specialists, and graphic designers, through to sales consultants, SEO consultants, social media experts, and programmers. To hire this level and diversity of expertise in-house, you’d need to invest a substantial budget in a huge team of staff. Marketing agencies work in a dynamic, fast-paced environment and it’s essential that they keep their skills constantly updated and stay up-to-date with the latest industry trends. In order to attract clients and offer new and exciting, in-demand services, agencies needs to stay at the top of their game and compete in an often crowded marketplace. Agencies also have the advantage of having built up experience in marketing for similar businesses across various industries, meaning they have plenty of knowledge that could benefit your company. Another benefit of working with an agency is that it’s an extremely flexible way of working, allowing you to scale up or scale down services based upon your specific requirements. As your needs change, the agency will simply change the way in which they approach your marketing strategy. After all, marketing encompasses a huge range of activities, from blogging through to technical SEO, and not every business will need all of these skills at any one time. And do you really want to spend thousands of pounds hiring a web programmer, for example, when you might not need them in eight months’ time? Of course, although this is possible with an in-house team, it is far less straight forward as you will have a fixed number of staff with a specific set of skills. This means that you might even find yourself having to outsource specific tasks that you don’t have the skills or expertise to handle within your in-house team. Outsourcing your marketing efforts will free up internal resources, allowing you to focus on what you do best. All too often, marketing roles are given to existing team members as an extra element of their role. Staff with too many different responsibilities may feel pressured and overwhelmed, meaning that their marketing tasks are overlooked. Outsourcing your marketing to an outside agency will relieve pressure on your in-house staff and free up internal resources, allowing them to be focused elsewhere. When you outsource your marketing division to an external agency, you will gain invaluable access to an external perspective. Looking in from the outside, the agency will be able to challenge you strategically from the very start of the project and offer advice on what has and hasn’t worked for other clients. This can be hugely valuable, particularly at times of major change or at the start of a new campaign. Putting your marketing strategy and activities in the hands of another company can be something of a daunting prospect for businesses – and that’s totally understandable. Although you’ll need to sign everything off and your agency will usually go above and beyond to ensure that you are happy with the results, you won’t have as much control as you would do with an in-house team. If you would like to discuss outsourcing your marketing with one of the UK’s fastest growing digital agencies please get in touch with the team today to arrange your free consultation.